2. 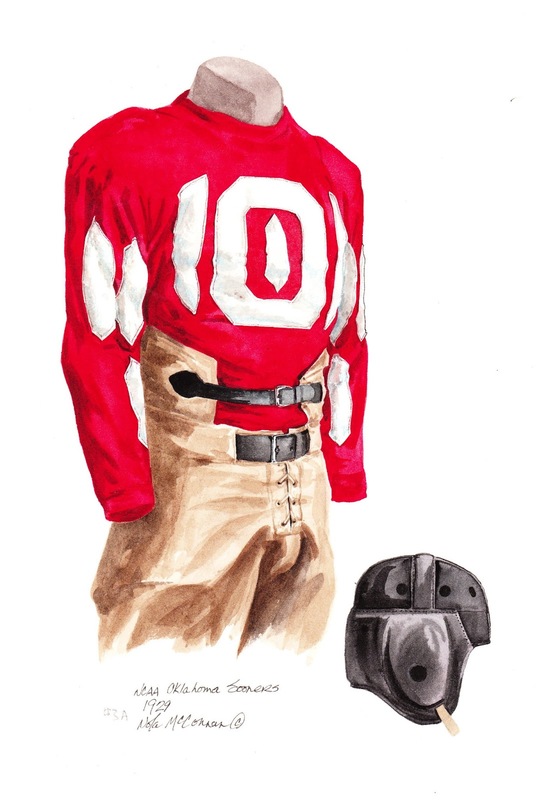 Please note that all of the actual original, one-of-a-kind artwork of the University of Oklahoma football uniforms as seen in the poster above are actually available for sale. These watercolor paintings are truly beautiful, original watercolor paintings, and there are only 16 of them so please act quickly if you would like to buy one. 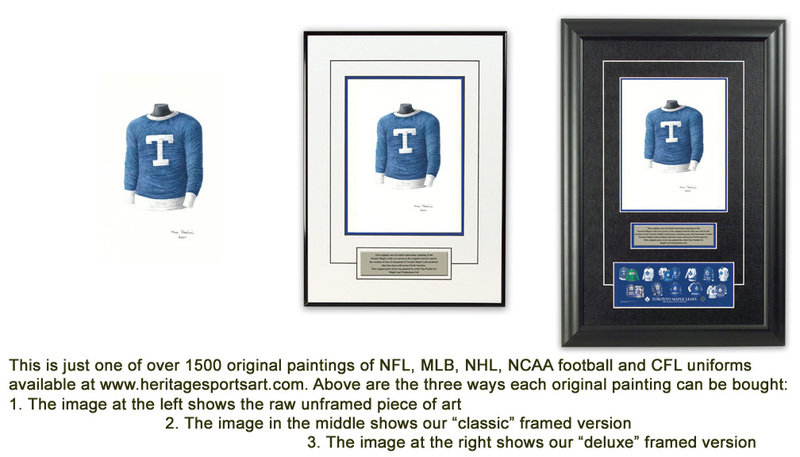 These would make a wonderfully memorable, beautiful and completely unique gift for someone who loves Oklahoma football. 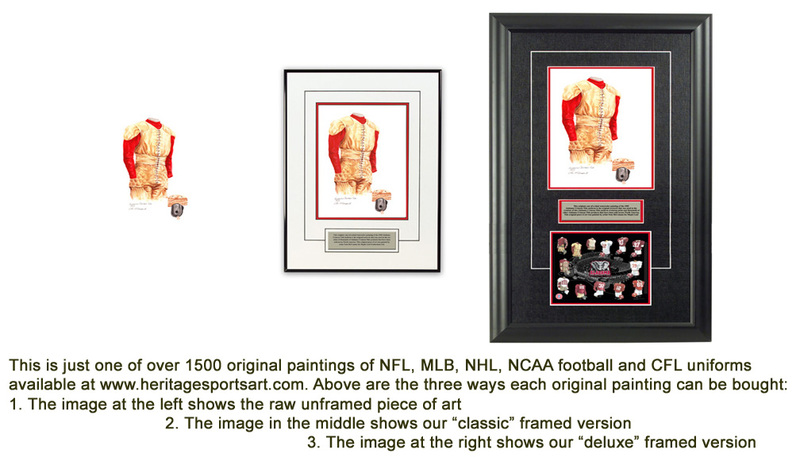 If you would like more information about this great artwork including the three ways you could purchase each piece, please visit our Oklahoma YouTube video at www.youtube.com/watch?v=zDh7WyxgHzQ or go directly to the artwork website www.heritagesportsart.com/Oklahoma-Sooners-c90/ where you can see and purchase the artwork. The University of Oklahoma, located in Norman, Oklahoma, was founded in 1890 - after initiated by the Oklahoma Territorial Legislature. Originally donated by town and country residents, the 40-acre campus boasts roughly 31,000 students and is Norman’s largest employer - a city of roughly 103,000 residents. 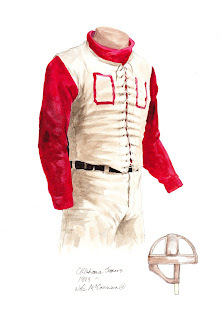 The football team played its first game in 1895 - a one game season which saw many non-students, including a local fireman, playing for the school team. 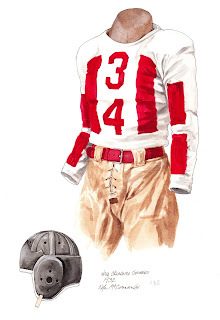 The Sooners football team plays out of Gaylord Family-Oklahoma Memorial Stadium (at Owen Field - in honor of former coach Bennie Owen), which was built in 1923 and seats 82,112 spectators. 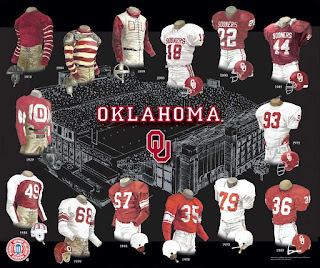 The University of Oklahoma boasts an excellent tradition of football success; countless Sooners have extended their football careers in the NFL, Arena League and the CFL. 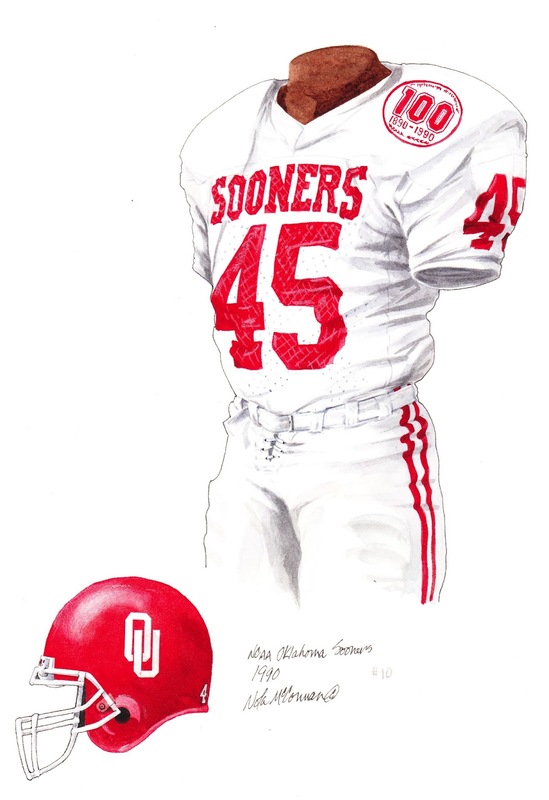 Notable Sooners alumni include: Roland Walter "Waddy" Young, Frank "Pop" Ivy, Billy Vessels, Steve Owens, Lee Roy Selmon, Brian Bosworth and Keith Jackson. 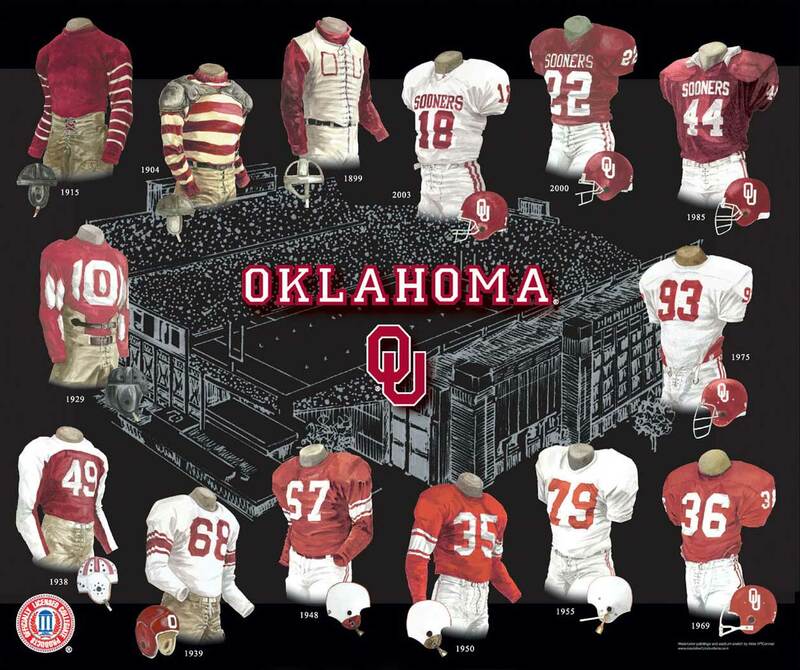 If Oklahoma was nationally ranked in "The Top 20" (or Top 10 in some years) in a particular season depicted in the poster, we show the team’s ranking. 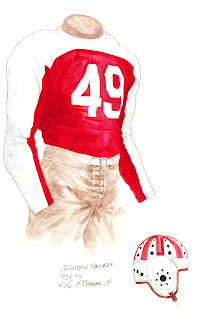 That being said, prior to 1936 there was no nationally recognized poll ranking the nation’s top teams, so you will not see any rankings prior to 1936. This painting honors the 1904 University of Oklahoma football team. Coached by Fred Ewing and captained by Byram McCreary, the 1904 team went 4-3-1, outscoring their opponents 204-90 - including an impressive 75-0 victory against Oklahoma State. Roland Walter Young, also known as "Waddy", was an End for the University of Oklahoma. In 1938, he was voted All-American, the first in school history. 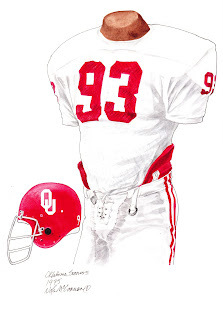 Widely known for his stellar defensive coverage, Young was an instrumental component of a Sooners’ defensive unit that only gave up a total of 29 points the entire season (which included a 17-0 defeat in the Orange Bowl to Tennessee). A versatile athlete, Young also excelled in wrestling and held the school’s heavyweight boxing championship title. 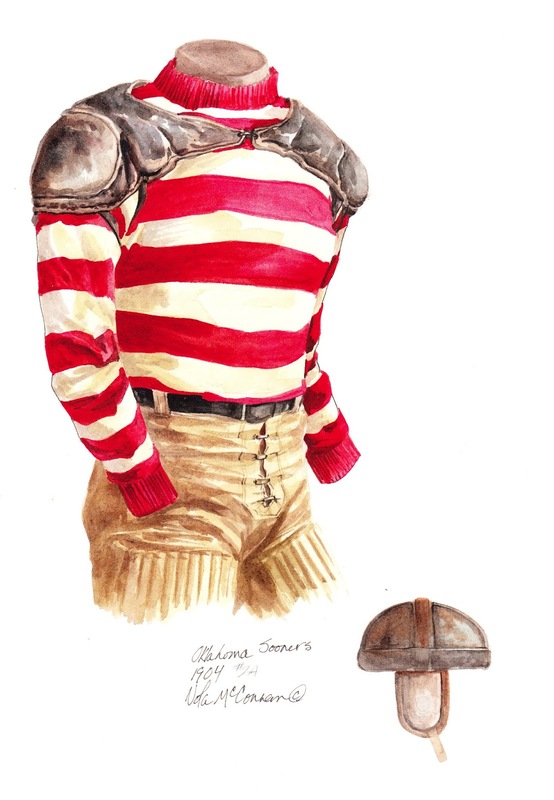 Following his career at the University of Oklahoma, he was drafted by the Brooklyn Dodgers and played for 2 seasons, before opting to serve his country in World War II and enlisting in the Air Force. Tragically, on January 9, 1945, during a raid on Tokyo, Waddy was killed in action. Here is what our friends at Wikipedia have to say about Waddy Young. He went on to the NFL where he played for 6 seasons. Here is what our friends at Wikipedia have to say about Pop Ivy. 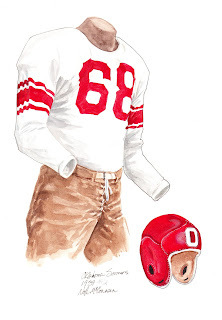 Paul Burris, also known as "Buddy", was a Guard for the University of Oklahoma - voted All-American in 1946-48 inclusive. 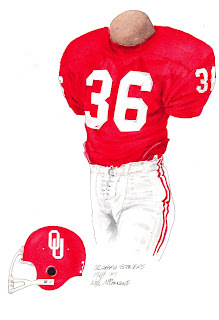 Following his career at the University of Oklahoma, Paul was drafted by the Green Bay Packers of the NFL and played Guard and Halfback. 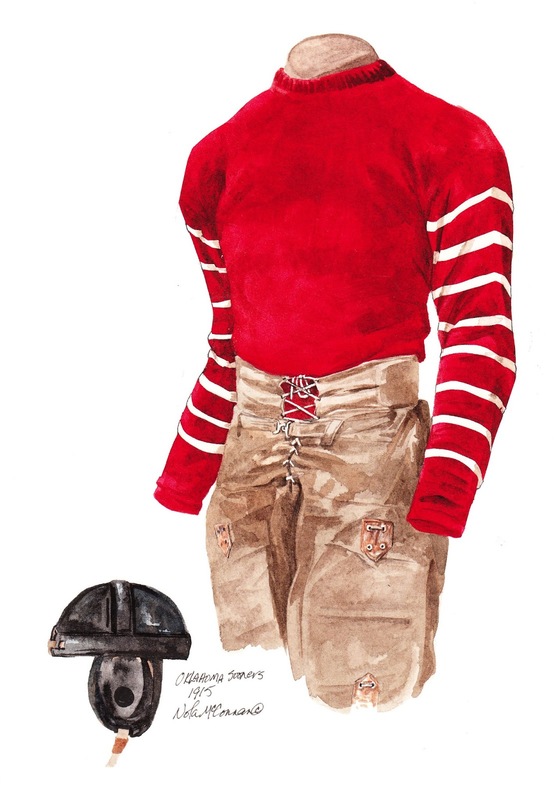 He played 1 season in the CFL. Here is what our friends at Wikipedia have to say about Billy Vessels. 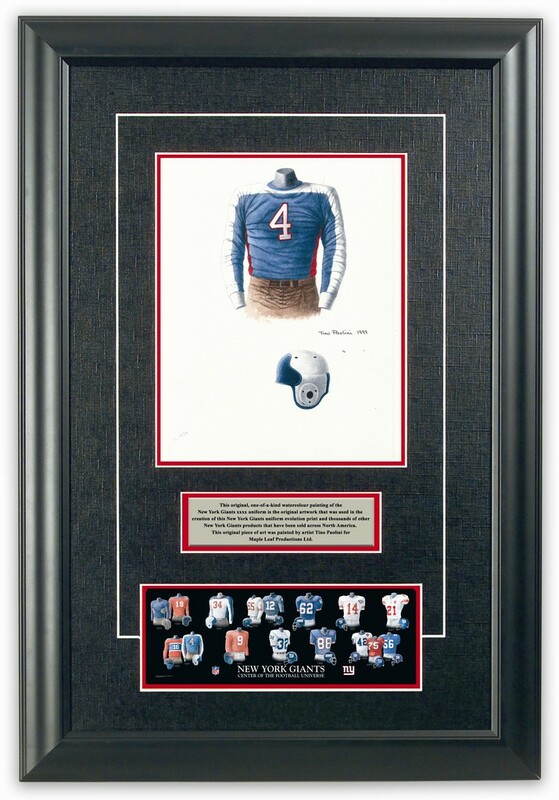 He was elected to the College Football Hall of Fame in 1991. Here is what our friends at Wikipedia have to say about Steve Owens. 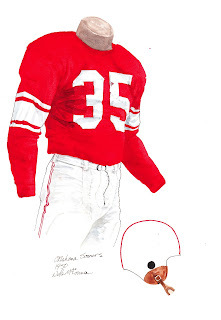 He was elected to the College Football Hall of Fame in 1988. He was recognized as the 39th best College Football Player of all time by the College Football News in their 2000-ish ranking. He was elected to the Pro Football Hall of Fame in 1995. 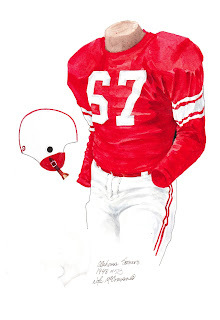 Here is what our friends at Wikipedia have to say about Lee Roy Selmon. This painting honors the 1985 University of Oklahoma football team and #44, worn by Brian Bosworth. 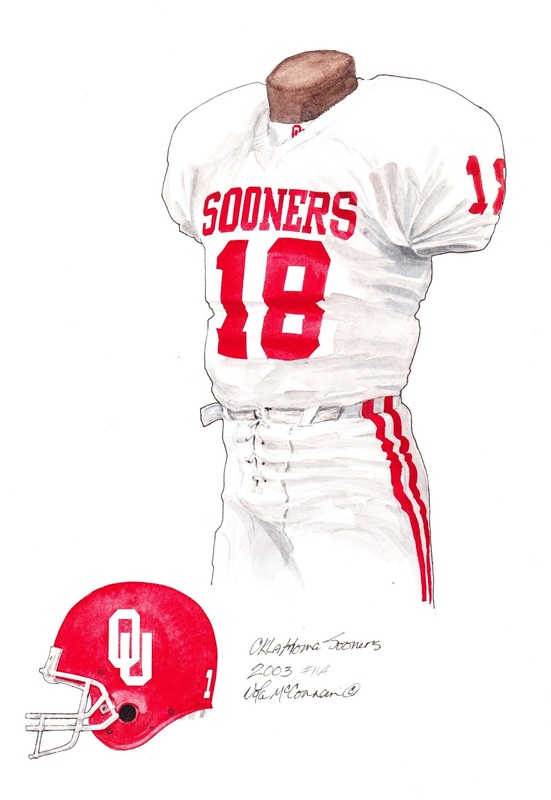 Coached by Sooner legend Barry Switzer and co-captained by Tony Casillas, Kevin Murphy and Eric Pope, the 1985 team went 11-1 and were crowned as National Champions. 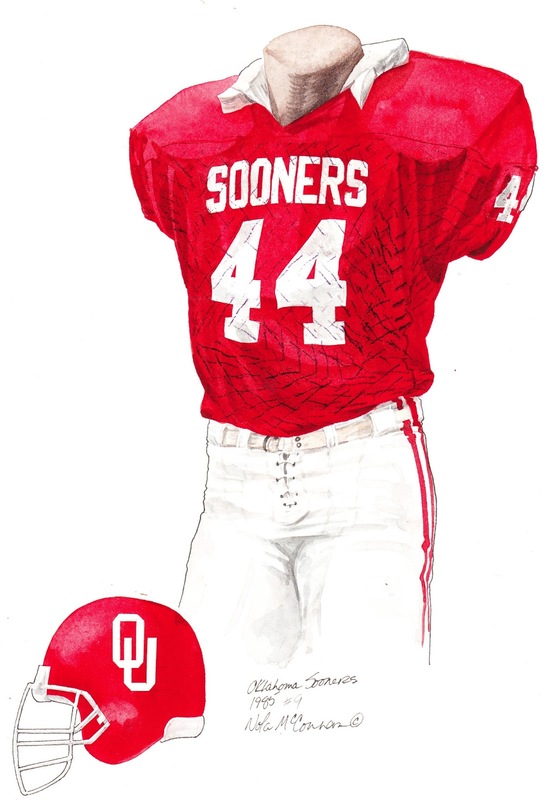 Brian Bosworth, also known as "The Boz", was a Linebacker for the University of Oklahoma. Notorious for his ferocity, arrogance, controversial nature and unusual hairstyles, Brian was never one to shy away from the public eye. After being banned from the 1986 Orange Bowl game, he stood on the sidelines wearing a t-shirt referring to the NCAA as the "National Communists Against Athletes" - which drew the ire of many, including Coach Switzer. On the field, his exceptional tackling ability helped him garner two Butkus Awards - as the nation’s top college linebacker, as well as being named All-American twice and All-Big 8 three times. However, due to off-field issues, he was eventually removed from the Sooner football team. 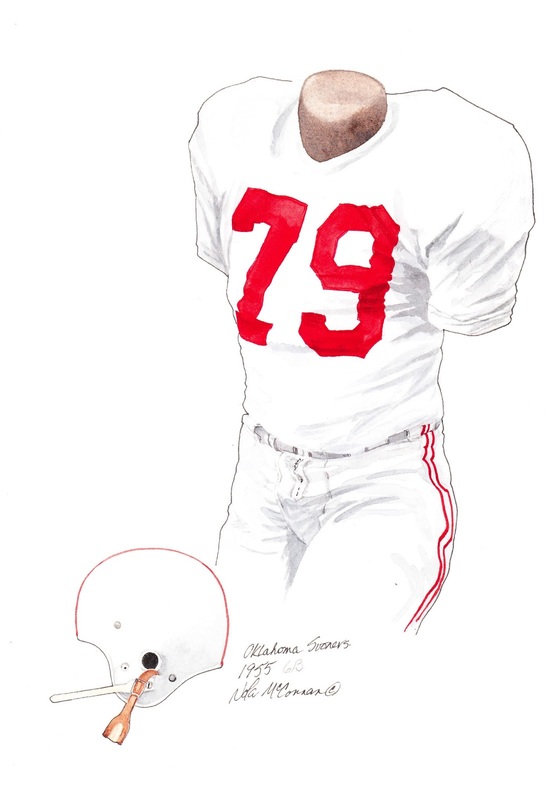 Having graduated early (as an Academic All-American in 1986), he was eligible to enter the NFL’s supplemental draft and was selected by the Seattle Seahawks in 1987. Despite his notoriety and being named to the 1987 All-Rookie Team, a recurring shoulder injury would ultimately bring his professional football career to a premature close. He was recognized as the 30th best College Football Player of all time by the College Football News in their 2000-ish ranking. Here is what our friends at Wikipedia have to say about Brian Bosworth. Quentin Griffin was a Halfback for the University of Oklahoma and a member of Coach Stoop’s 2000 National Championship squad. The team beat Kansas State 27-24 in the Big 12 Championship Game on December 2, 2000, before defeating the Seminoles 13-2 on January 3, 2001 for the title. Following his career at the University of Oklahoma, Quentin was drafted by the Denver Broncos in the 2003 NFL Draft - and was named starter in 2004 (after predecessor Mike Anderson was injured). In March 2006, Griffin signed a one-year contract with the Kansas City Chiefs, but was subsequently released the following September. On February 23, 2007, with the 2nd overall pick, he was selected by the Hamburg Sea Devils in the NFL Europa Free Agent Draft. A summary of his NFL Europe League career can be found here. Here is what our friends at Wikipedia have to say about Quentin Griffin. top-rated passer, but would complete 278 of 451 passes (61.6%), accumulating 3,846 yards and 40 touchdowns. In addition to winning the Heisman Trophy that year, Jason was also named ‘consensus’ All-American, ‘consensus’ Big 12 Offensive Player-of-the-Year, AP Player-of-the-Year, the Davey O’Brien Award winner and recipient of the Jim Thorpe Courage Award. After receiving a medical hardship by the NCAA, Jason was allowed to play a second senior year in 2004 and finished 3rd in Heisman Trophy balloting. He concluded his career at the University of Oklahoma as the all-time leader in career passing yards (7,768) and touchdown passes (79). Here is what our friends at Wikipedia have to say about Jason White. 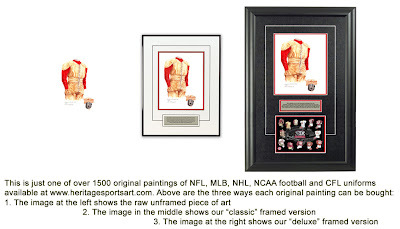 If you love the University of Oklahoma and the history of Sooners football, you might really love to own an original piece of artwork celebrating the team's historic uniforms as seen in the poster at the top of this blog - you can actually own one of those original pieces of art! There are only 16 pieces of original art available for sale, and when these 16 are sold, that's it, they're all sold out. 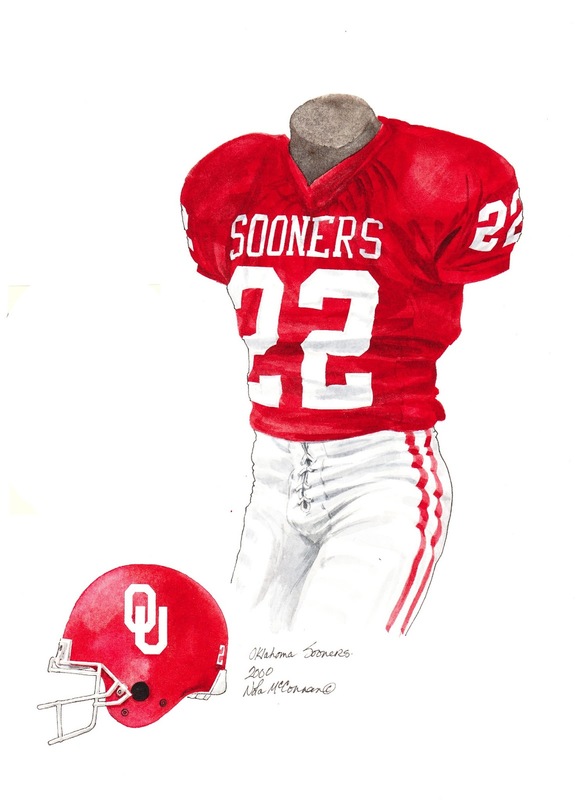 If you would like more information about this great artwork including the three ways you could purchase each piece, please visit our University of Oklahoma YouTube video at www.youtube.com/watch?v=zDh7WyxgHzQ or go directly to the artwork website www.heritagesportsart.com/Oklahoma-Sooners-c90/ where you can see and purchase the artwork. 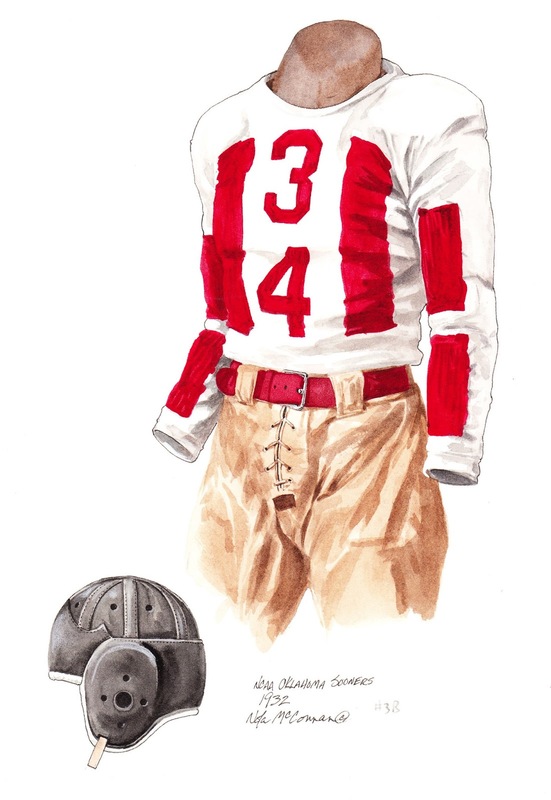 Just FYI, the 1904 team was captained by Byrom McCreary, not Byron. We see that mistake sometimes. Many thanks for taking the time to write and I have fixed that error! All the best for a great new year! Many thanks for the great pickup on your part! I hadn't realized that I had uploaded the wrong image - I have now fixed the error. Many thanks for having such a sharp eye!